Really like that snapshot photo; looks like a professional pic. I have a photo “somewhere” that has very similar writing on the back; possibility same photographer. A goal this year is to be more organized so hopefully I’ll get my act together. The Transogram piece looks brand new. I don’t understand why they even put their names on the packaging since the plastic figures “almost” have an exact likeness. Wonder how they chose who was going to be in the three pack? I’m a sucker for photos so the recent posting of the B&W pic is very cool. While I don’t personally have a lot of phots I’d like to add more in the future. Should have added them earlier since the pricing for Type 1 photographs are going up quickly in price. This next item is much tougher than the previous item I posted (3-player Transogram box with cards and statues). I purchased it on eBay years ago in a group of about 12 single boxes. 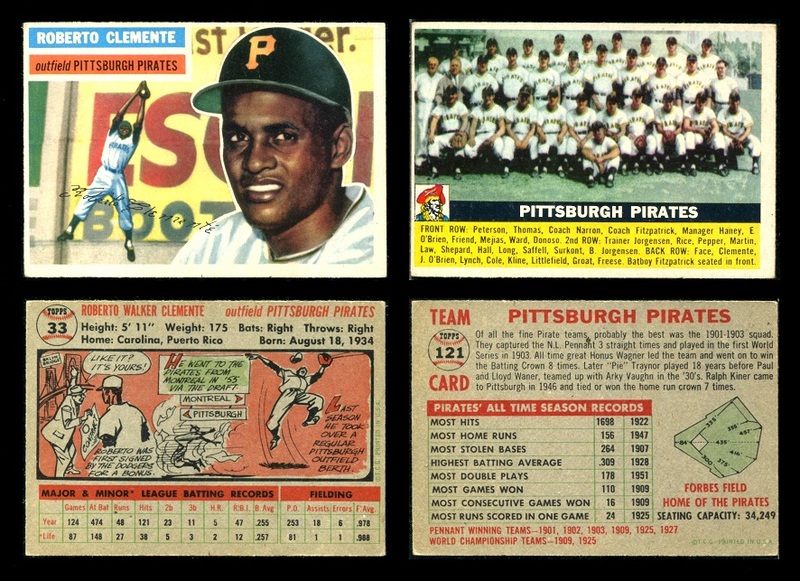 I have since sold the rest, but kept the Clemente. 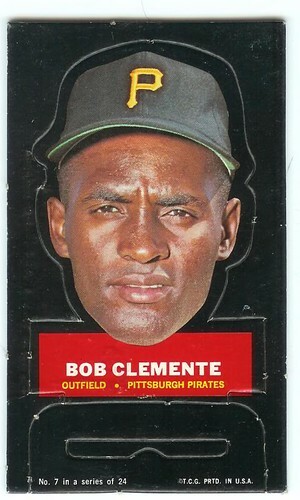 I can't remember the last time I saw a single Clemente but it seems like it has been years. 1969 Transogram boxed statue with card...not sure why the 2nd photo appears hazy, it is not like that in hand. Great thread, and I'll really be looking forward to this! Thanks a lot for sharing your collection! Thanks Eldon, hope you enjoy the rest! Similar to the busts that Mike (71buc) posted earlier in this thread, this item was issued later than the originals in 1973. I have always been curious about that one. Is it solid or is it a coin bank with a slot like originals? I'm pretty sure it is solid, but I will find out. Last edited by docpatlv; 01-12-2018 at 11:30 PM. 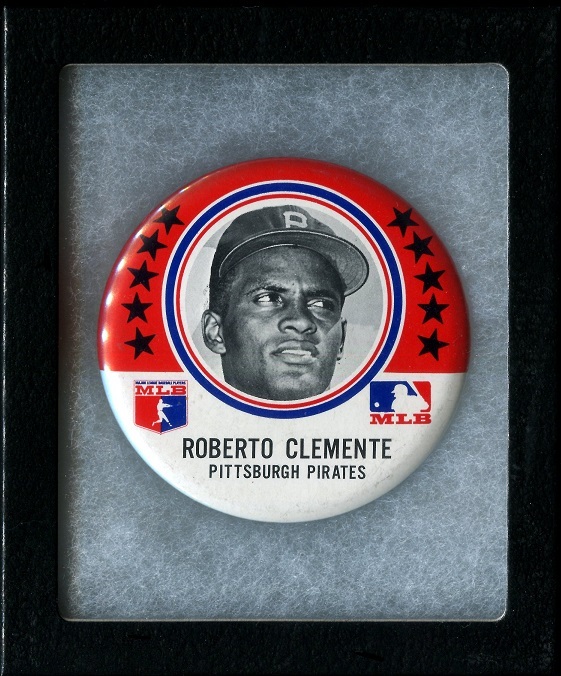 Roberto does not have a lot of vintage pins (especially PM10s) compared to Mantle or Mays, but this is one of my favorites. Roberto has a good number of regular issue cards and this is probably my favorite. The ‘72 is a close second; love the look of that card! 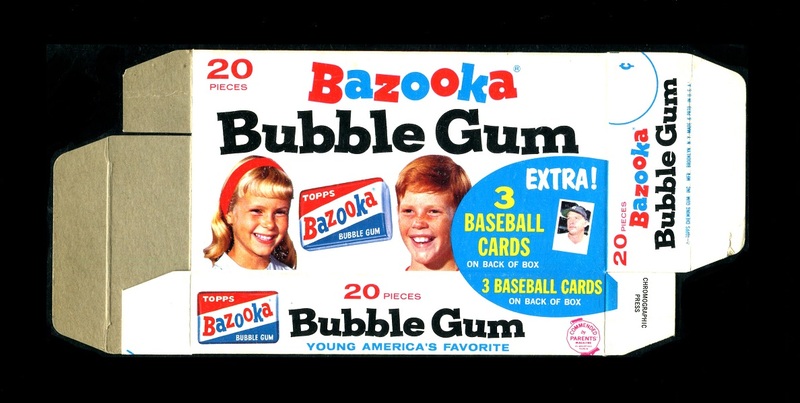 I agree, the 72 Topps regular and In Action are two of my favorites. When I first purchased this next item, it was genuinely a tough item to acquire. Many years later there was a find of these (still sealed in original packaging) which made them much more available and much cheaper as well. I have purchased duplicates of these over the last few years because of that find. Really enjoying the thread. 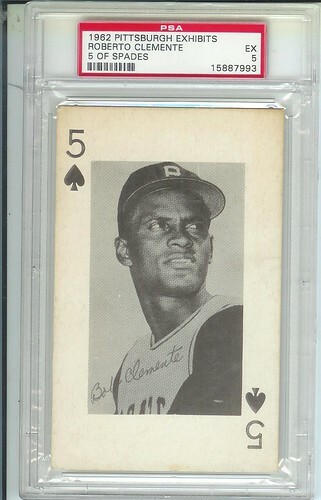 So the card I'm posting is on most Clemente Collectors (and many non Clemente collectors) want lists. Many have never seen one. Ironically the first time I saw a 1958 Kahn's Clemente was at the first Robert Morris show I set up at (2nd show that was ever run there). 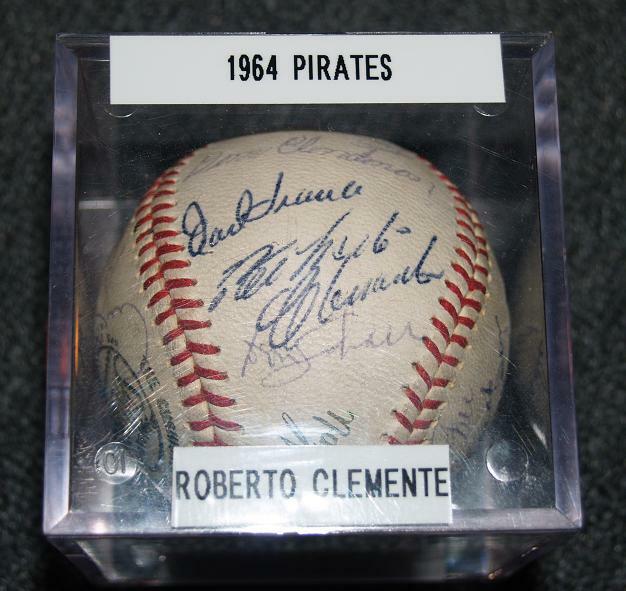 I was overwhelmed with the number of Clemente items - many of which at the time I had never seen. 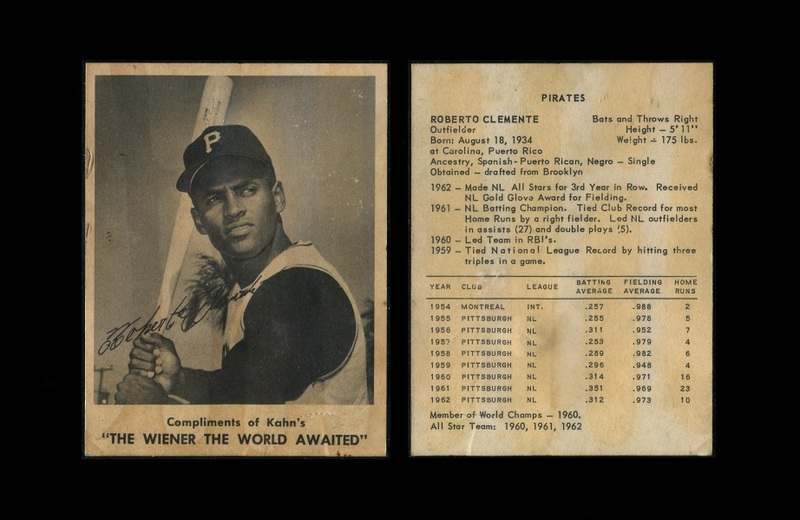 When a guy walked in and showed me his 58 Kahn's (in really nice condition) - it was just another Clemente card I hadn't seen yet. He wanted "full book" price on it (at the time I think $500-$600). He said if I wouldn't pay full book for it, I had no idea what I was looking at. Neither of us budged. He was right! It took years before I held another in my hands. I have been fortunate enough to have owned 3 of them (2 of them long ago sold to other collectors) in the last 30 years - the one pictured is far and away the best condition one I have had. 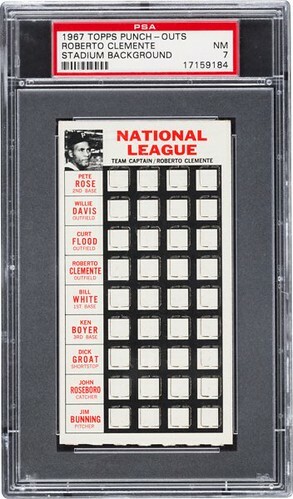 As a beginning to understanding how tough this card is -PSA has graded 32 Kahn's Clemente's from 1957, 23 from 1959 (another tough card) and just 7 from 1958. 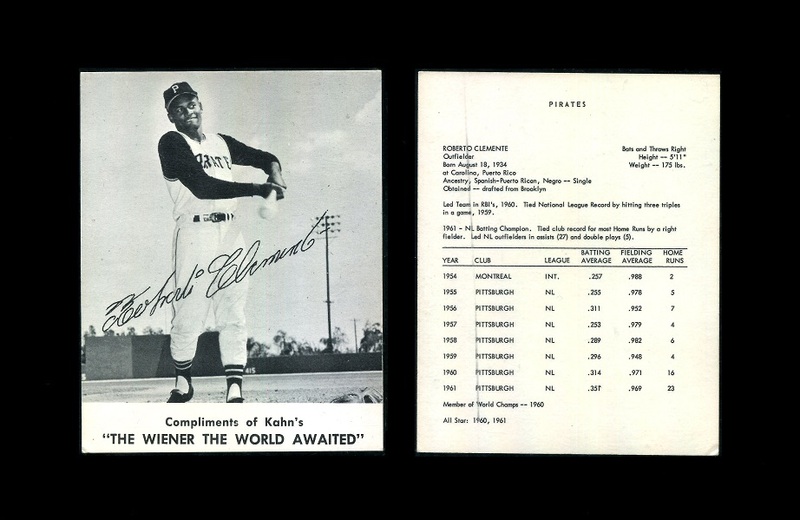 I just googled "1958 Kahn's Clemente" and not 1 image of this card appeared (I did spot images of every other Clemente Kahn's issue. Definitely one of the highlights of my collection. I have never understood or heard speculation as to why this card (and the 58 set in general) is so much tougher than any other. Enjoy! That is a gorgeous card! I still don't have one, and probably never will. I have no idea why it's so scarce either. Love the unique pose. Another item that I've been able to obtain multiples of. 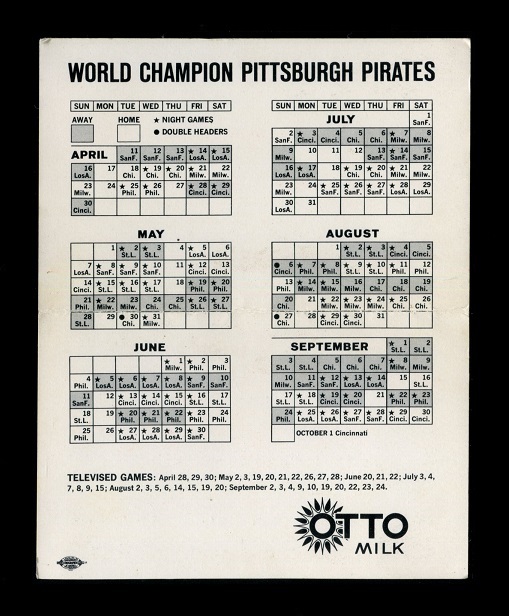 One of my favorite pocket schedules. 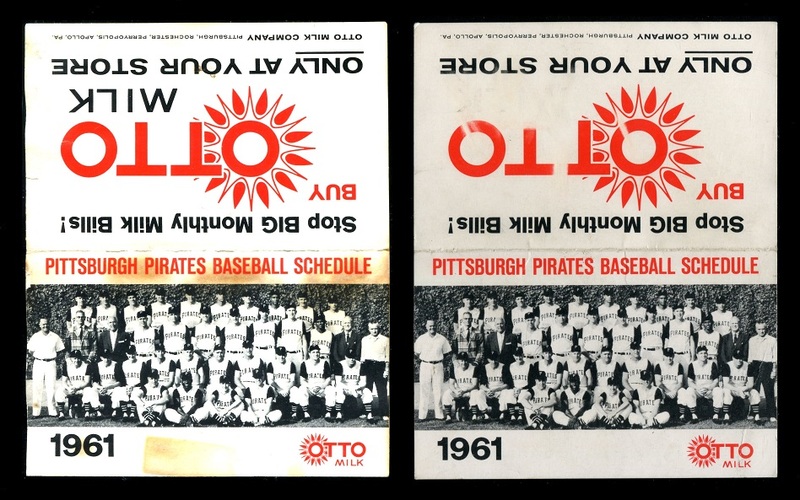 1961 Otto Milk Pirates pocket schedule...and dupes. Jim Beckett had a 58 Kahns and he pictured it in his Annual Price Guide. I always figured that I would be able to find one because of that. 7 is a low population, but I have found cards with lower populations. This has a psa pop 5 and is highest graded. This has a psa pop of 5 with 1 higher. This has a psa pop of 5 with 1 higher. 2 sold last year. This is my favorite card. It has a psa pop of 3 with 2 graded Auth. So I have hope that one day I will get a 58 Kahns. 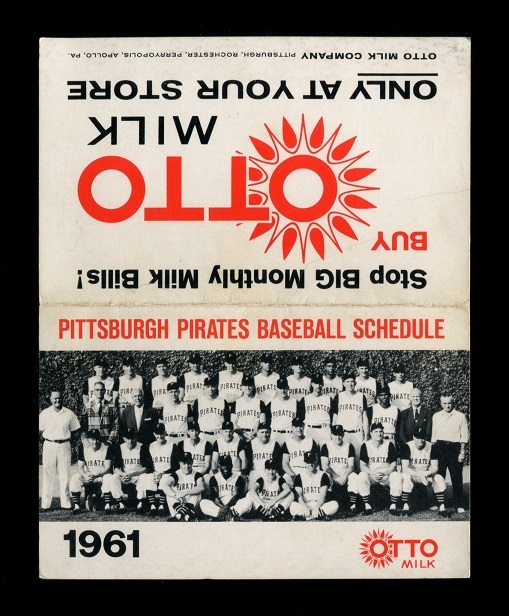 This set of 1971 Pittsburgh Pirates Autograph Cards is one of my favorites. It was hard for me to come by a nice complete set with the checklists. If you are so inclined to put this set together for some reason PSA will not grade the checklists. If interested here is the population report. https://www.psacard.com/pop/baseball...ph-cards/94568 I doubt it reflects the availability of the cards as I am sure that there are few people who actually grade them. There are 34 graded Clementes so that may serve as some what of a barometer? Last edited by 71buc; 01-17-2018 at 01:58 AM. Great stuff rats60 and Mike! This is the first baseball I picked up with Roberto's autograph. I picked it up the same year that I purchased the signed photo in one of my earlier posts. Again, purchased from Ed Dolan's Baseball Fanatic Super Store in NJ. Does anyone know if Ed's store is still open? It was, by far, my favorite store to shop at back in the day. Wow! Some very cool and rare items being shown; oddball and test issue items are always my favorite. The ‘58 Kahn’s is very nice; I don’t believe I’ve seen this particular year before. 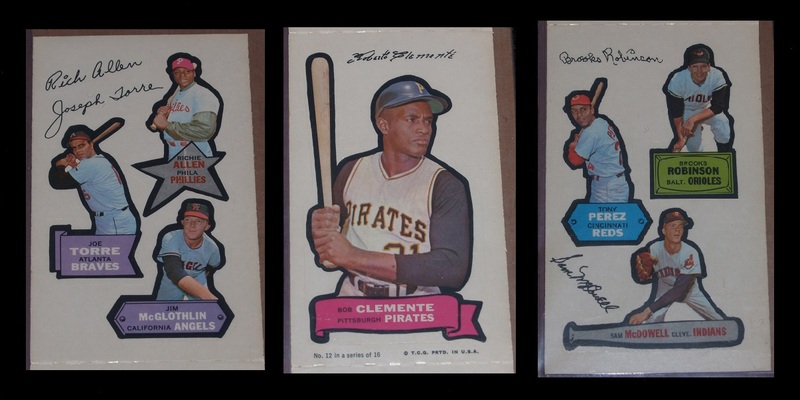 While I’m not to crazy about the looks of the Stand-ups I guess I just like them because of their rarity and the Clemente is no exception. Sure wish Brooksie was part of the grouping. This is the only complete box I have in my collection, picked it up at a local card show many years ago. 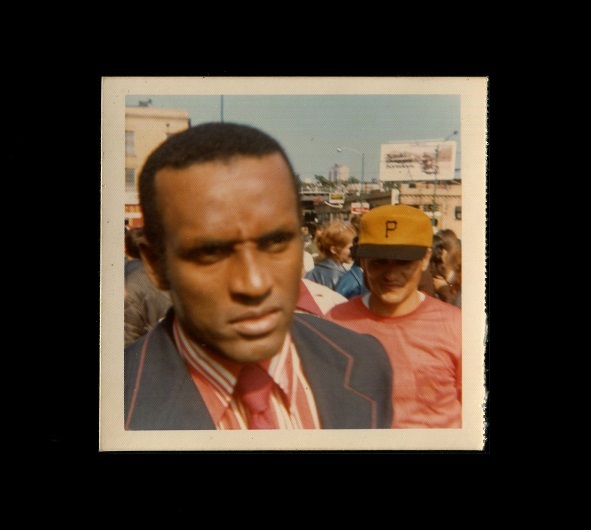 Although I don't necessarily collect Clemente photos I have a number of them. This one happens to be my favorite. I share it with a bit of trepidation. 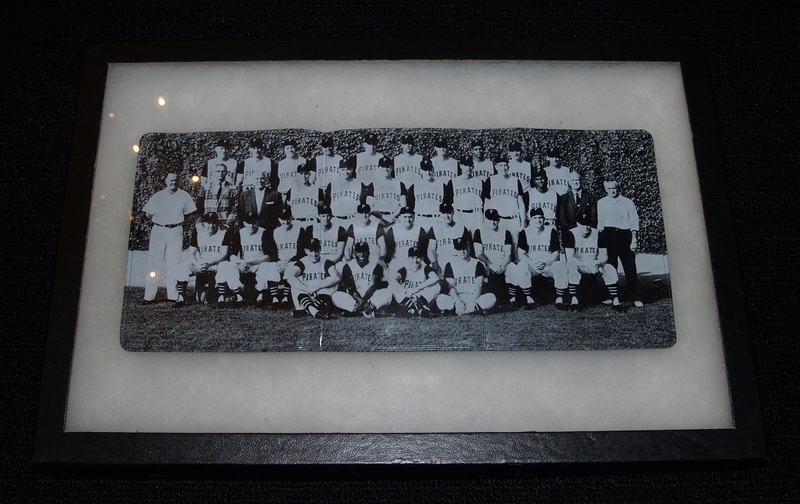 It is an original 11" X 14"Les Banos photo printed high quality archival paper. I think it is one of the most beautiful images of Roberto and is seldom seen. I placed a rudimentary, and hopefully unobtrusive, watermark on it to protect it from theft. 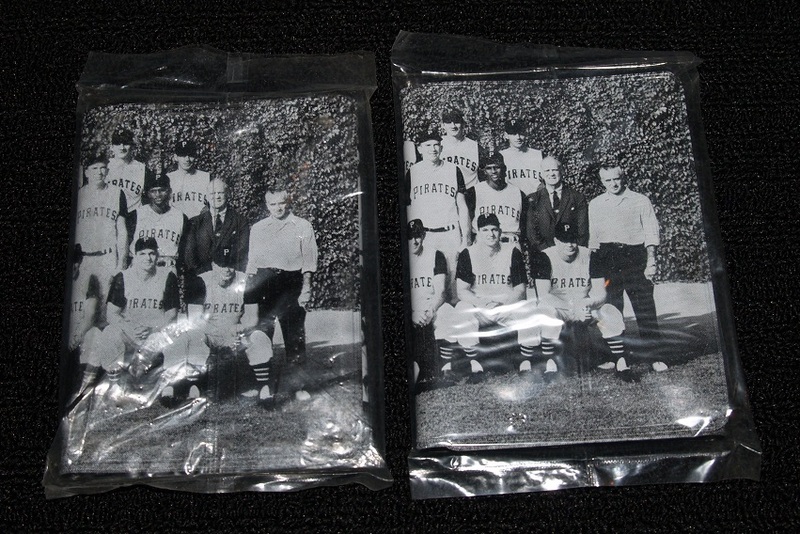 Unfortunately there have been a number of photos I have posted that have been copied and put up for sale eBay. 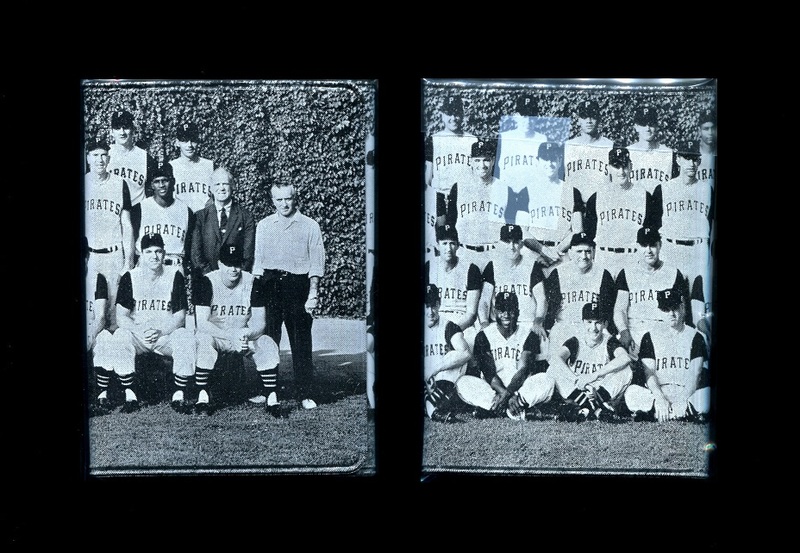 Banos was the Pirate team photographer for many years. He doesn't seem to get the credit he deserves as an artist. His work can be expensive and due to this I only have a few examples. You can read more about him here if interested. Great photo Mike! Why do the borders appear that way, is it in a frame? That's the way it was printed. It's not in a frame or matted. Never ever seen even a pic of '67 stand-up until this; only knew of it by name...cool. This next item shows up every once in a while, but I think it's still a pretty tough item to come by, especially if you're looking for a particular panel. Great looking ‘68 AS Sticker Panel. That’s an item that I don’t have the full panel; I do have the one panel with Brooks included. 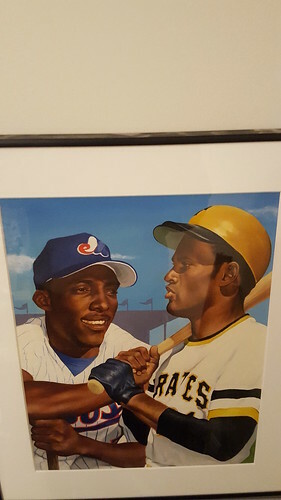 Also I have a proof of this item and I think it’s the only piece I have with Clemente and Brooks included together. I’ve seen them come up for sale a couple of times over the years and have come up short. I don't have the other panel with Clemente on it, I don't see that one show up very often. Well, on day # 21, I thought I'd post a couple of my favorite Roberto items. Not the most expensive, but tough to find. They do pop up for auction every now and then. A few years ago, a trio appeared on eBay in one lot, but I was one of the underbidders. If I didn't have it already, I probably would have made more of an attempt to win the lot. 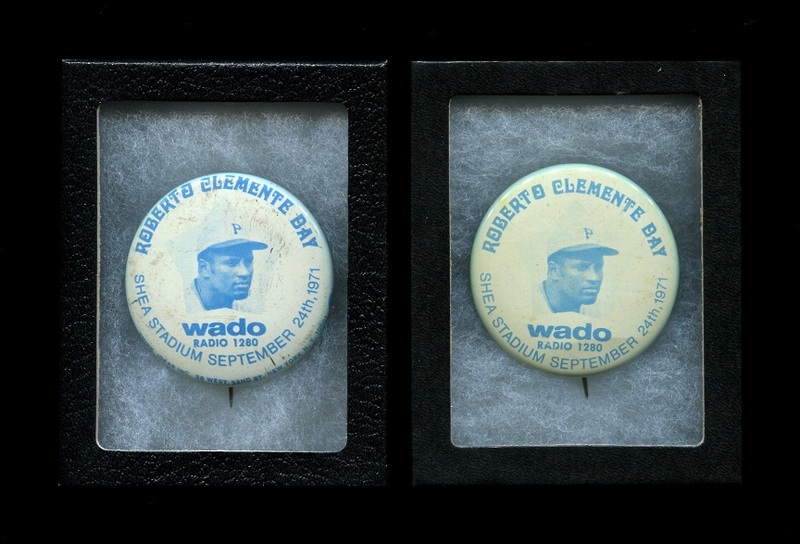 "This rare button celebrates Roberto Clemente Day at Shea Stadium September 24, 1971. It was sponsored by the NYC Spanish language radio station WADO 1280, which is still on the air. Clemente was honored while he was still alive (died 12/31/72). The button is 2 1/4" in diameter..."
Picked this up a few years ago at a Royals game stadium auction. Never really fit in my collecting scope but picked it up anyway. 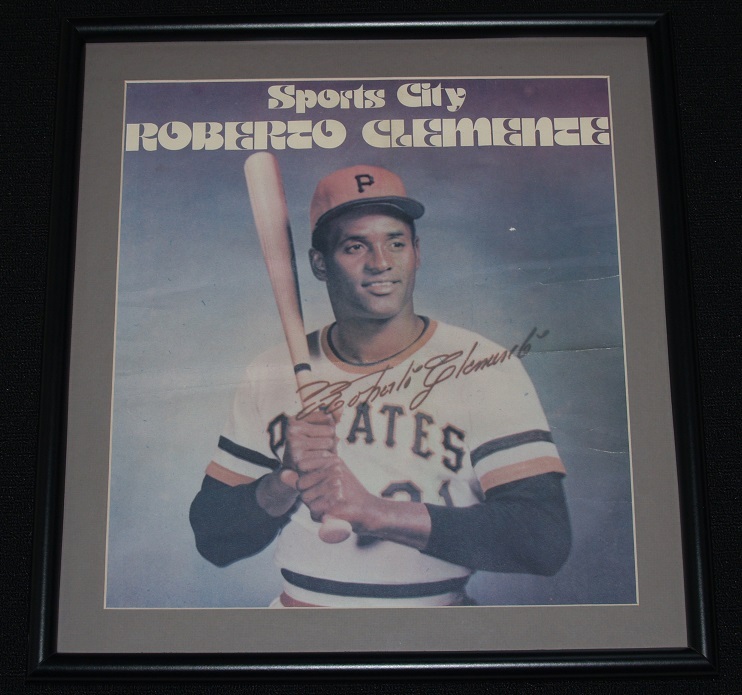 It was used on Roberto Clemente Day game in KC for the opening pitch. 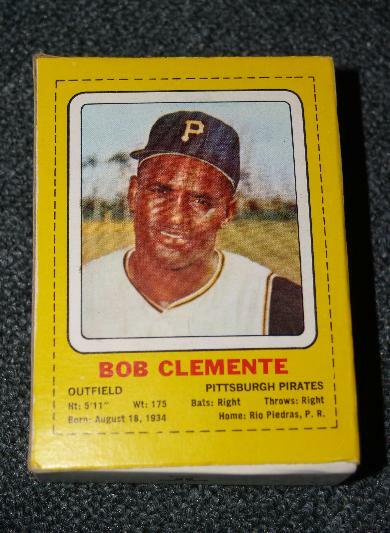 If would fit into someone's Pirate or Clemente collection, PM me. I'd enjoy this going into the proper collection. Great display, shame it's stored in a tub in my basement. Haven't seen that home plate before Craig, thanks for sharing. I think the '62 Kahn's is one of the more interesting RC items out there in terms of the atypical stance/pose capture...the Kahn's in general are a pretty cool series for him. The Kahn's are one of my favorite "sub sets" and one of the most difficult to complete - add any kind of reasonable condition and it gets exponentially harder. 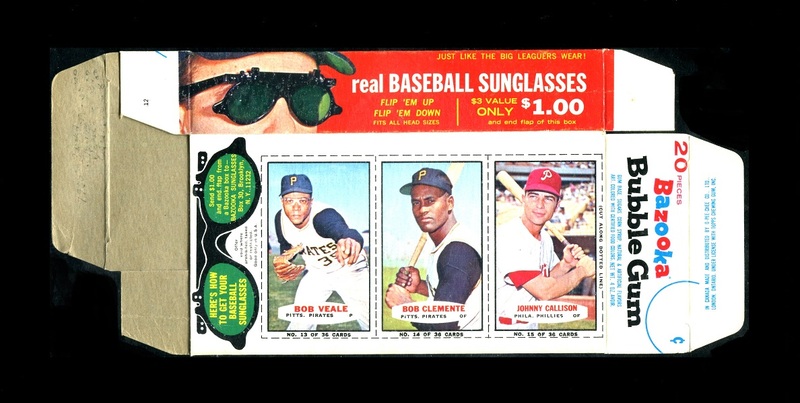 The only subset I like more are complete bazooka boxes - still looking for the 1960 box - my life regarding Clemente would feel complete if I were to acquire it and also looking for some size variants from other years. 1960,1962,1963,1964,1965,1966,1967,1968,1971 - I have confirmed production of 20 piece and 25 piece boxes for all years except - 1964 (I have not seen/confirmed a 25 piece Clemente box, but have seen another player), 1968 and 1971 (believe these only came in 25 piece size). Last edited by hcv123; 01-22-2018 at 05:43 AM. Agreed that the Kahn's are a great Clemente series. Unfortunately I'm still missing a lot of them. Have lost out on a few recently at auction. For some reason I'd really like to pick up the 1966 issue, but rarely see it offered. I passed on one years back because the tab had been cut off, and looking back I probably should have just purchased it and tried to upgrade later. Interesting to note I used to see almost no 1959's years ago and thought it to be almost as tough as the 58's. In the past 5-7 years a number of them seem to have surfaced. Also interesting that the 1957 is not as hard as one would think. I would trade for a nice 59 - I also need a 58 (probably never get one) and a 61. Howard, interesting info on the Kahn’s. 1967 and 1968 Soda bottle caps - yes, all the soda varieties are Clemente and include - Coke, Sprite, King Size coke, Tab, 2 different Fresca's, Fanta Orange, Fanta Grape, and Fanta Root Beer. 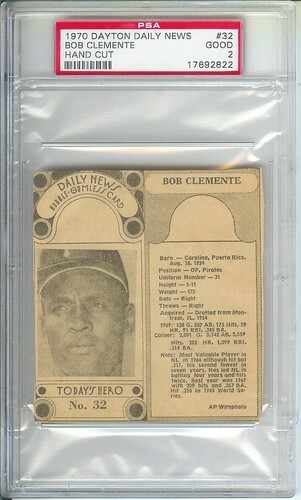 There are quite a few other flavor variants, but none that I have seen with Clemente. I got as crazy as beginning to look for the standard (common) Coke caps from different bottling plants - stopped that in a hurry. At the top of the box are a 1960 World Series pen/pencil set and a 1971 world series pencil (missing the pen . Great items again! That 66 Kahn's is perfect. Great run on the bottle caps too, I only have one (Coke) and really wasn't going to pick up other brands, but maybe I'll pick up a few different now. Yes , mine does have a plastic coating. Super tough pin. I too don't recall seeing another. Don't happen to have a 1971 world series pen to go with my 1971 pencil do you? Get photos of that glove and glove box up here! I'm sure people viewing the thread would love to see it! I know I love looking at it. Last edited by hcv123; 01-23-2018 at 09:47 PM. Thanks for the response Howard. Sorry no 1971 Pencil I wasn't even aware such a thing existed. Thanks for the heads up As I said my pin doesn't have the plastic film. 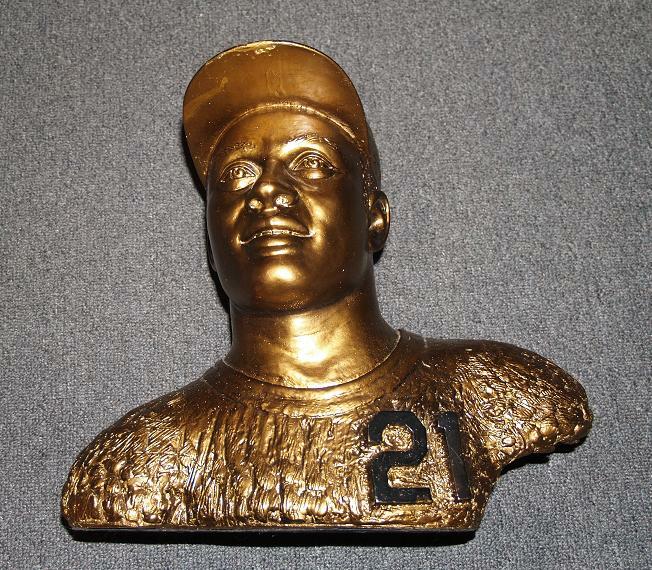 I believe Scott Garner has a Nolan Ryan from the same series sans the plastic film. As requested here is a mint condition 1971 Rawlings World Series Special Glove. Although it is not in mint condition the box features Roberto and Brooks. I have only seen one other and it was missing the lid (not visible in my pics unfortunately). The link below is to the other glove that I am aware of. It sold in a Hunt auction eleven years ago. For the heck of it I am including another Les Banos 11X14 photo. I really love his work. Last edited by 71buc; 01-23-2018 at 11:15 PM. This next item was obtained from board member Dan B. many years ago. I don't remember if it was a purchase or a trade, I think I traded a Koufax snapshot for it. ca. early 1970s Snapshot Photo...I love how Roberto is just walking around all the fans. And that suit!!! I think I probably said it before, but really like the Brooksie/Clemente glove and glove box. When the glove/box came up for sale I was short on funds so it would have went for more, but I’m really glad I didn’t have the cash and you ended up with the piece. Goes so well with your collection. I am sorta like you with the gloves with maybe a slight different reasoning. I started to collect all of the different versions of Brooks endorsed gloves back in the day and got to the point I didn’t really like the gloves or how they displayed. I guess that’s weird for a Brooks collector to not like gloves, but just didn’t get the enjoyment out of them. Now a mint condition one, or game used may be a bit different. Very cool snapshot by the way! Last edited by Mark70Z; 01-24-2018 at 04:31 PM. I wish the glove & box was part of the collection. Unfortunately, the other Roberto/Brooks item I have is not on the same level as Mike’s glove/box, but it’s the only one I’ve ever seen. This is a piece of original artwork that I bought from Topps back in 2001. 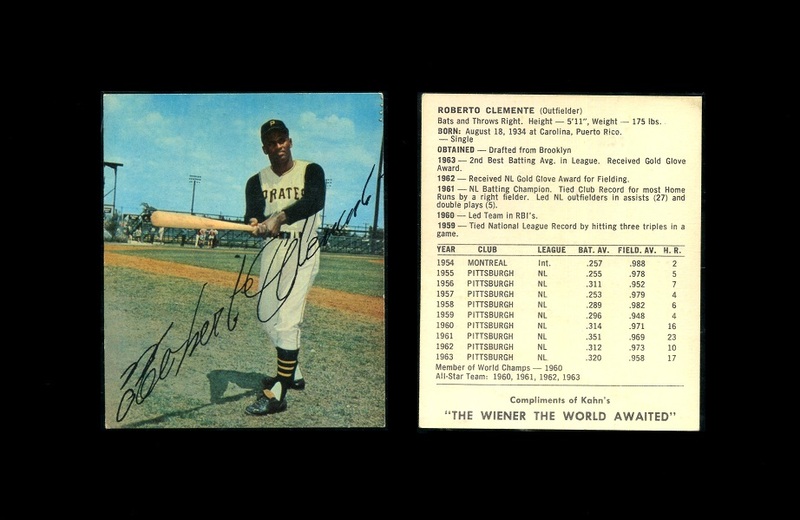 It was a card of Roberto Clemente and one of our newest Hall of Famers, Vladamir Guerrero called "Latin Heat." 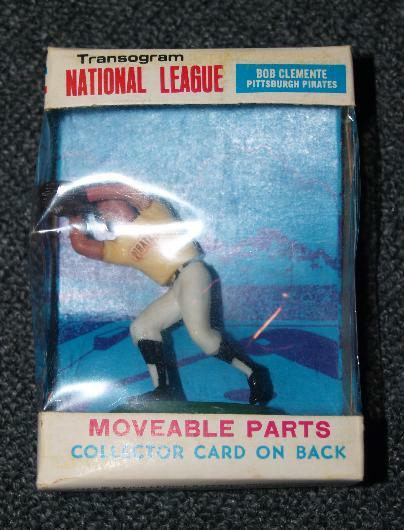 Are you a Clemente collector also? Purchased this at a small local show and framed it myself. It is on heavy matte stock. Didn't know exactly what it was for years, but later learned that it was a poster for a telethon in the 70s. My example has had the telethon info cut out. 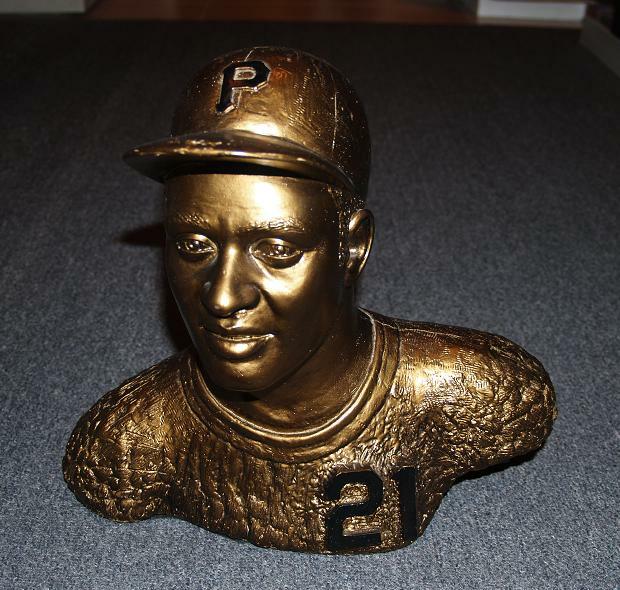 I have been collecting Clemente for over 40 years. Very cool poster Mike that's the same image on the pin Howard posted in #15. That's the first time I have seen that item. What size is it? I am certain being on the West Coast has limited my access to such items. Thanks for sharing it. Last edited by 71buc; 01-25-2018 at 07:56 PM.